Discover the wonders of Hollywood on the newest model of Haibike electric bicycles. Choose from three scenic destinations including Lake Hollywood (1.5 hrs), the Griffith Observatory (2 hrs), or the famous Hollywood Sign (2.5 hrs). 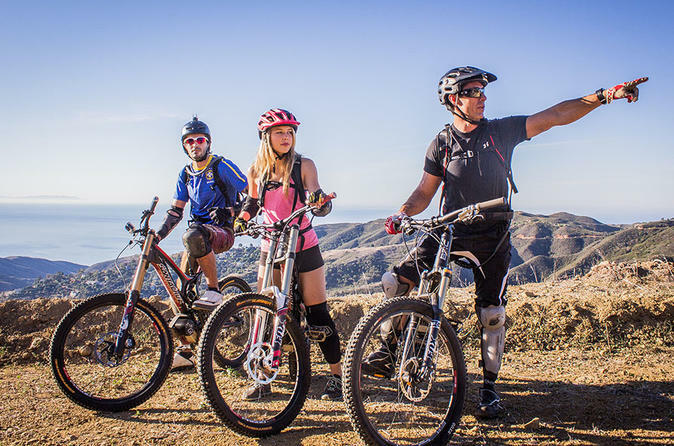 Follow your guide on an easy breezy ride up the Hollywood hills and enjoy spectacular views overlooking Los Angeles. Biking up the Hollywood hills will require minimal effort due to the powerful pedal-assisted electric motor, allowing you to focus on admiring the beautiful homes and views of LA. A small group size (2 riders max), free water bottle, and a helmet. This is a personalized fun and safe experience. Meet your guide in front of Shake Shack on Hollywood Boulevard that will familiarize you with riding the electric bicycle. After you receive your helmet and thorough instruction, your guide will then lead you on an adventurous tour to your chosen destination (Lake Hollywood (1.5 hrs), the Griffith Observatory (2 hrs), or the Hollywood Sign (2.5 hrs)). Ride through the beautiful Hollywood hills neighborhoods and admire the unique homes. Enjoy a lovely ride around the Hollywood reservoir and learn about the history of the Mulholland Dam. Stop for scenic pictures of the Hollywood Sign overlooking the lake. Then, continue riding up to Lake Hollywood Park that sits right under the Hollywood Sign. Take in all the stunning views overlooking Los Angeles before looping back to the start. Ride up the Hollywood hills and through the gorgeous neighborhoods. Arrive at Griffith Park and enjoy a quick breakfast and coffee at the cafe while enjoying the nature and wildlife. Continue riding up to the Griffith Observatory for a great photo opportunity overlooking all of LA. Tour the Griffith Observatory and learn about the cosmos (as time permits) before looping back down to the start. Bike through the beautiful Hollywood hills neighborhoods and admire the unique architecture. Ride around the Hollywood reservoir and learn about the history of the Mulholland Dam. Stop for scenic pictures of the Hollywood Sign overlooking the lake. Then, continue riding up to Lake Hollywood Park to be right under the Hollywood Sign. Next, continue up to the peak of the hills that directly overlooks the Hollywood sign. Your guide will tell you a little bit about its history and how this sign became so iconic. Enjoy views overlooking LA before looping back to the start. After you return to the original location in front of Shake Shack, your guide will give you additional travel tips and recommendations to help make your stay in Hollywood the most memorable.